Streams of music notes forming circles and revolving around each other, giving a feel of a 3D object of music floating in space. The perfect video loop for your DJ, VJ or VDJ sets, it's a video download not to be missed. 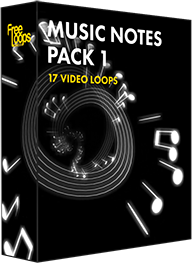 This video loop is part of Music Notes Pack 1.